Soon after the launch of the affordable apartment lottery, local elected officials and the ST-PCV Tenants Association were urging tenants to apply for it while the window of opportunity remains open. Though such a move might seem obvious, the pols, who held a press conference outside Stuyvesant Town last Thursday, had reason to issue the reminder. In 2013, when the Roberts v. Tishman Speyer litigation was settled, those same politicians and tenant leaders went door to door in the complex to advise neighbors to apply for their damages, with many tenants not realizing they had to fill out paperwork for the long-awaited cash for rent over-payments. Additionally, many former residents, when called by tenant volunteers, didn’t even know they were entitled to anything. After the T&V editorial on the SBJSA ran last week in the print edition, many offered negative comments online about New York City Council Member Dan Garodnick. I met him for the first time many years ago when he first ran. He was friendly and seemed quite intelligent and won. But Mr. Garodnick does need money each time he runs – as do all politicians. He may have first been elected as an idealist. But, now he lives in the real world of politics. Often people in his position morph into self-serving pols who run on helping the regular folks and end up accepting money from people in the real estate industry. Remember that power corrupts and the more one gets the greater corruption. I gave quite moderate contributions to Obama and Sanders – so modest, that when and if they were or are elected, they owe me nothing. But, certain industries via lobbyists don’t care about the idealism or lack of it when they support a pol. All they desire is to be able to have access and call them directly or via a surrogate to suggest legislation which is in their financial interests. This is my hypothesis about the insulting comments concerning Dan on the T&V Blog. And, if true it represents just a microcosm of what continues to occur in this city’s apartment and business rents – higher and higher. This also is happening in most areas of this nation. If you have TWC they are running an important documentary on NY1’s Ch. 1020: “The Vanishing City.” This represents a comprehensive and honest explanation of what’s going down and affecting all of us. See it! I hope that the comments that I made on a Blackstone survey might keep Associated, an affordable and well-run supermarket, in our community. This would save the jobs of its many employees and prevent them from being among the “proud-to-be poor” that Benita Therock described in her letter. I suspect that most stabilized tenants are like me. We came to ST-PCV as young couples and young singles with careers decades ago. We have carried our weight as residents of this community. We worked, paid our taxes, voted, raised families, participated in a variety of ST-PCV events, donated and volunteered at local schools, religious institutions, and at community-based charities. We spent our weekends cheering on our kids at Little League and soccer games, just like other Americans across this country. Some of us long-time residents have gown older. We retired, and despite our savings, our money doesn’t go quite as far as before. But through rent-stabilization, we are fortunate to be residents in the ST-PCV community and in New York, the city that we’ve worked for, lived in and loved. This is home. Standing in the front of a crowded 14th Street bus on the way to my physical therapy, I looked with envy at all the teens and twenty-somethings packing the seats and thought: “This is the future of America.” But I wasn’t envious because they were young but because they were sitting. Next to me on this bumpy bus, a frail lady clutched a pole for dear life and an elderly man with a cane struggled to keep his balance. Other white-haired passengers looked on as the laughing youngsters competed for attention, shouting and sharing their latest selfies with their techno-savvy friends who were also busy on their phones, texting or talking animatedly or just staring at something on the screen, oblivious to the reality around them. I found myself imagining these youngsters as adults standing behind podiums at a televised debate for the President of the United States, competing to get the attention of the TV moderators so they could talk about their many virtues and their life’s goal of helping and caring for the poor and middle class, indeed for all humanity — a verbal selfie, if you will, albeit a bit Dorian Grayish. When the bus stopped at Union Square, the Future of America finally got up and got off, leaving their warm seats. Then the elderly and disabled people moved slowly and shakily to the newly-vacant seats, eased their tired bodies down and sighed with relief. Ah, the future of America! I hope I’m alive to watch those candidates in a future debate which I think will be exactly like the current debates, just with different faces. I could use a little comedy before my final ride where I’m sure to get a seat or, more exactly, a bed. Firstly, the words “climate” and “weather” are not synonyms. The former refers to the world’s atmosphere over given periods of time; weather refers to temperature, precipitation, humidity, etc. in one specific area at a given time and attempts to predict the next few days. Then there is science which we all have learned – but, usually a list of facts – with little emphasis on what “the scientific method” really means and its importance. There is also the difference between the weathermen we see on TV (who are usually selected for on camera appearance and likability) and climatologists who are scientists. John Coleman, whose documentary where he posits on the false assertions of climate change, is a weatherman (who worked on WCBS and WNBC and is now CEO of the Weather Channel). I am aware that about half of weathermen (and women) agree with Mr. Coleman. But, 98 percent of climatologists and other scientists all agree with climate warming and its relationship since the industrial age as increasing amounts of carbon have been increased via humans’ use of fossil fuels. Which group has the background to achieve credibility? Gamaliel Isaac, your allusion to the superstitious beliefs of the Xhosa in South Africa reminds me of the about ten persons hanged during the Salem witch trials. How one can compare the concerns of scientists to those of primitive groups – as you refer to the Xhosa tribe in Africa (or my example of the Puritans in Salem is beyond me). If someone in the early 20th Century said that two small electronic units: one in the U.S. and the other in the U.K. could communicate without any wires, they would be thought to be crazy — but through the marvel of the scientific method, it can now be done. CNN reported yesterday that each of the last six months successively have been recorded as the most warm since record keeping began. And, see Sunday’s NYT Magazine (11/15) on the continuing melting of the polar icecaps. And, science is nether liberal nor conservative. Although primary day is just around the corner, local elected officials aren’t facing any challengers. After all, defeating a popular incumbent is a next-to-impossible task for an unknown candidate. There’s only thing even more difficult. Defeating a popular, 22-year incumbent in the general election when you’re an unknown Republican and democrat voters outnumber Republicans six to one. But Nicholas Di iorio, a former seminary student who was more recently a contractor with Pfizer, believes he’s got a shot. The reason, said the 28-year-old Upper East Sider (who lives a few blocks away from his opponent, Congresswoman Carolyn Maloney), is redistricting. The district today encompasses much of the East Side of Manhattan, including Stuyvesant Town/Peter Cooper Village, midtown and the Upper East Side as well as Astoria, Queens and part of Williamsburg in Brooklyn. The redrawing of the district maps in 2012 means that the area that became the 12th district is “now more Republican than it’s ever been,” said Di iorio. So much so that he’s lost interest in a reality show he’d last year planned to participate in that would have followed his campaign and another race deemed to be unwinnable. A July Daily News story reported that the show idea was turned down by the Esquire channel, but according to Di iorio, though he did want to do it initially, he’d changed his mind even before it was rejected by the network. 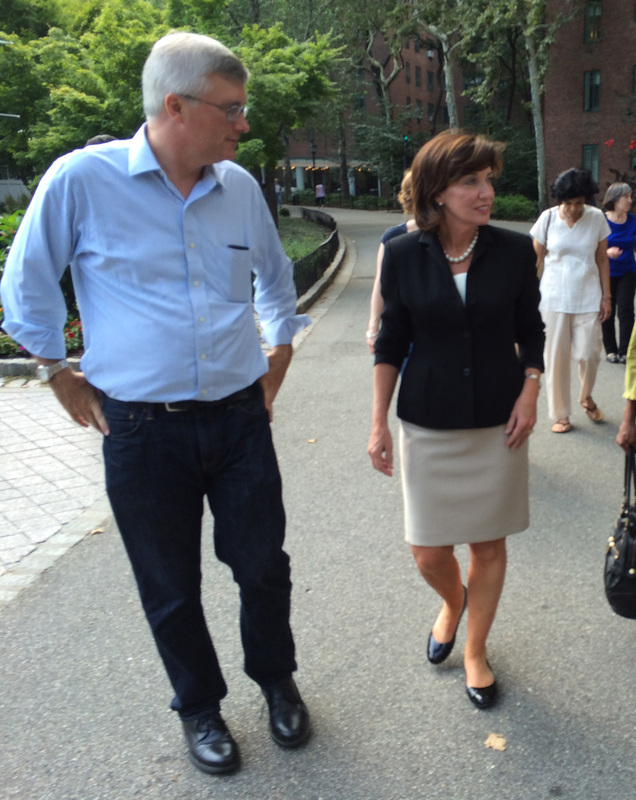 The Stuyvesant Town-Peter Cooper Village Tenants Association, which has recently enlisted the aid of the de Blasio administration in an effort to maintain some affordability in the complex, is also now hoping it will have an ally in Kathy Hochul, Governor Cuomo’s choice for the next lieutenant governor. “You got a whole afternoon?” was Steinberg’s answer. Tenants then began chiming in about the dormification of the community with students packing into apartments in order to make the rent affordable, major capital improvements (MCI) for what often seems like unnecessary work — and tenants’ frustration at having to pay for those improvements in perpetuity — and the fear of both longterm and newer tenants of getting priced out. Other topics brought up included more longterm tenants’ fear of harassment, increased transience and questions about what will happen to the rents when the J-51 tax abatement expires in the year 2020. Steinberg also briefed Hochul on the TA’s partnership with developer Brookfield aimed at a condo conversion as well as CW’s lack of interest in talking business with them. Al Doyle, the former president of the Tenants Association, brought up the ongoing issue of predatory equity throughout the city, with Stuy Town, of course, being the poster child for the practice. Kavanagh and Garodnick brought up that they wanted to see the rent laws get strengthened, but the State Senate hasn’t exactly been friendly to tenants. While refraining from making any promises, Hochul said she thought the community is “worth fighting for.” If she becomes lieutenant governor, she pointed out, she’d have the tie-breaking vote in the event of a deadlock in Albany. From 2011-2013, Hochul represented New York’s 26th District, which includes the areas of Buffalo and Niagara Falls. During her time in Congress, she lived with colleague Carolyn Maloney in Washington. When the group walked past the Public Safety office, Garodnick, realizing officers might think tenants were about to rally, made a point to say hello and introduce Hochul to Public Safety Chief Bill McClellan. 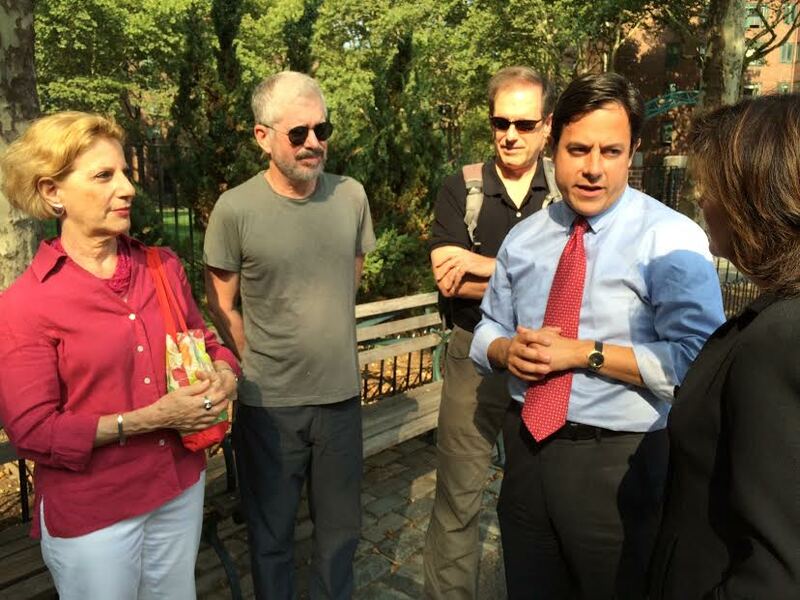 Soon afterwards, Hochul left the complex at First Avenue and the crowd dispersed. Steinberg then said that she did feel Hochul was genuinely listening to tenants. “I think she got it,” Steinberg said. Kavanagh also said he thought she’d make “a strong partner in the executive branch,” and support tenants, while Garodnick also said he believed Hochul would be in tenants’ corner. “She is clearly a serious and thoughtful person who was willing to take the time to understand our unique challenges,” Garodnick said. Doyle, meanwhile, just seemed happy that the would-be lieutenant governor got to hear firsthand from tenants how all the different types of rent increases were impacting the community. “Homeowners outside the city, when we tell them how (an MCI) is a permanent increase, they don’t believe us,” he said. Following the stroll, T&V asked what Hochul’s thoughts were on the Cuomo administration doing something to preserve dwindling stability and affordability in the community. 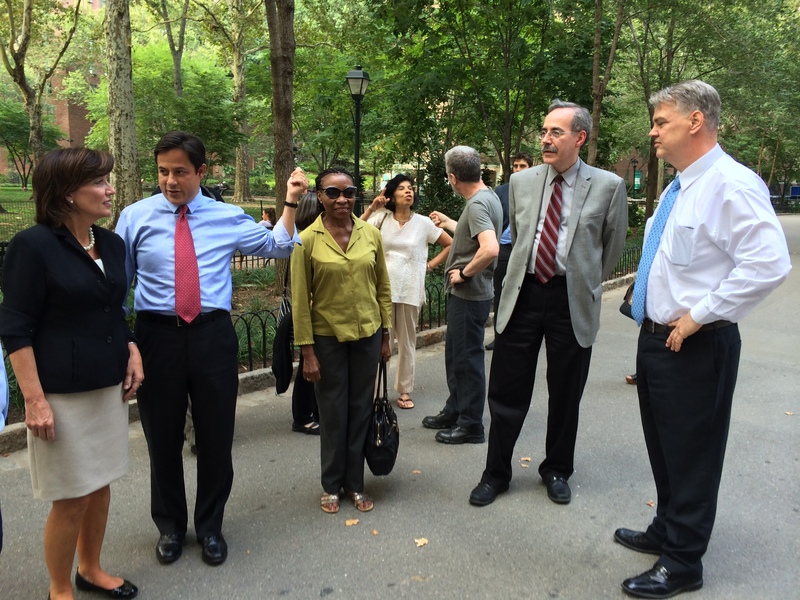 Mayor de Blasio came to Stuyvesant Town last week to sell his vision of affordable housing for all – including designating ST-PCV as part of his plan for affordable housing throughout Manhattan. Apparently, the Tenants Association did not press the mayor on the TA’s clearly stated goal, made on behalf of thousands of ST/PCV tenants: a tenant-led, non-eviction condo conversion of the property. In fact, however, the TA failed to contact the bondholders, and took no further steps on behalf of the 11,000 tenants who wanted to take charge of their destiny and have a seat at the table. A condo conversion keeps things affordable because long-term tenants can remain in their apartments, without the fear of ever-increasing MCIs that are designed to squeeze tenants until they leave. A condo conversion allows the new stabilizers to become new homeowners. Mayor de Blasio needs to stand up in solidarity with tenants and the TA that has worked so hard for a condo conversion. First, he sandbagged our councilmember, lobbying for Dan Garodnick’s opponent in the speaker race.Now he is sandbagging the Tenants Association. Whose side is the mayor really on? UPDATE: Following Town & Village’s Wednesday afternoon press time, the de Blasio administration has discussed options being explored in the effort to keep Stuyvesant Town affordable with the press. The de Blasio administration has since ignored multiple requests by T&V on what the mayor’s thoughts are on the now-canceled foreclosure sale as well as the Tenants Association’s plan to rally on Friday, the 13th of June, over concerns about the future. While Garodnick has said he’s gotten the sense the mayor’s office is trying to be helpful to tenants, considering de Blasio’s declarations on the campaign trail, there really shouldn’t be any question as to whether or not he should get involved in the fight for continued affordability in the complex. Lip service isn’t enough and yet right now there isn’t even any of that. The silence is deafening.